Sorry for the delay in posting a book today… I am still having computer problems accessing my dashboard with my blogger site. Is anybody else having similar problems? 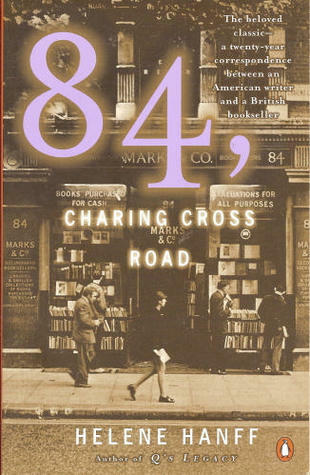 84 Charing Cross Road is a delightful tale of friendship that evolves via correspondence over a 20 year period between freelance New York writer Helene Hanff and secondhand book dealer Frank Doel in London. Their friendship spanned from 1949-1969. I’m one of those people who *gasp* underlines and writes in their books. Most books get this treatment though not all. In fact, one of my friends and I have been known to share a book and share the comments in the side margins. I know… rather dorky and strange : ) Perhaps that’s why I like the above quote so much. When we share a book we’ve loved, don’t you think in essence we’re sharing a little part of ourselves, making ourselves vulnerable in the hopes that the other person will love those quotes and that book as much as we did? What are your thoughts?? I would love to hear them and what book you would love to share with me! Over 1200 bloggers joined the 31 Day Challenge, check them out here!